Fourth and fifth grade students at H.O. Brittingham Elementary in Milton made clay owls with an encouraging word, such as Hope, etched into the front. Recently, the owls were donated to Tunnell Cancer Center where team members will give them to patients. 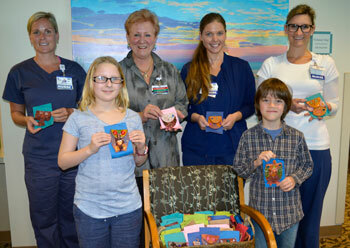 “The students donated about 60 clay owls to our patients. It is truly touching to see young people creating something that will be so meaningful to our patients,” said Cherrie Rich, Executive Director of Tunnell Cancer Center. Mrs. Barbara Evans, a teacher in the Cape Accelerated Program (CAP) came up with the idea and partnered with Mr. Daniel Richards, an art teacher at H.O.B. Two students from the class presented the clay owls. “When students can get involved in helping their community in meaningful ways that matter to them, the lasting benefits can be far-reaching,” said Mrs. Evans of the experience. Shown are (left to right) Jordan Warrington, RN; Cherrie Rich, Executive Director of Tunnell Cancer Center; Jillian Abbott, RN; and Leks Howard, RN. In front are H.O.B. students, Sarah Rowley and Brayan Stevenson.